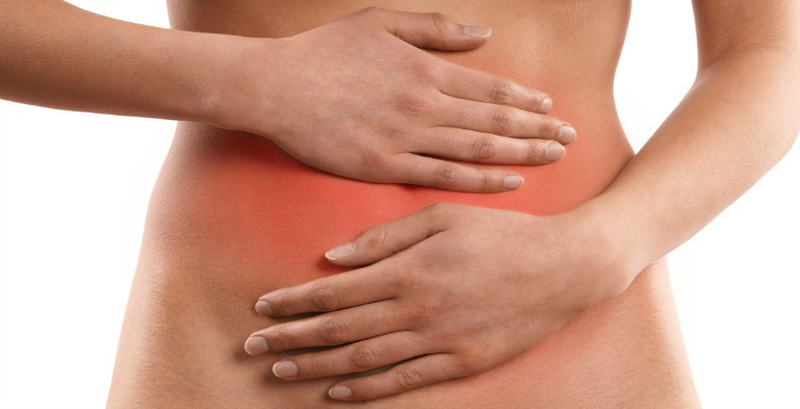 What Causes Pelvic Pain During Period? Is It Normal to Have Bad Pelvic Pain? Approximately once in a 28 days cycle, if no sperm fertilizes the ovum, the uterus in a female contracts to shed its lining. This process is triggered by prostaglandins, which are substances that mimic hormones and are formed in the uterine lining during menses. They result in muscle cramps and contractions quite similar to pains occurring during labor. They may also cause diarrhea and nausea. These contractions inhibit flow of blood to the uterine lining or endometrium. This may also occur due to high levels of substances called leukotrienes during menses. Various underlying medical problems have been linked to period pains. Endometriosis: In this condition, the tissue lining the inside of the uterus develops or grows outside it. Uterine fibroids: Characterized by noncancerous growths or tumors in uterine wall. Adenomyosis: The tissue lining the inside of the uterus grows in the muscular uterine walls. Cervical stenosis: In this condition the cervical opening is small limiting menstrual flow. PID (Pelvic inflammatory disease): It is a STI or sexually transmitted infection that results from a bacterium. Majority of the females suffer from mild to moderate pelvic pain. This is referred to as “primary dysmenorrhea” medically and is not due to any underlying disease or condition. The cause of primary dysmenorrhea is prostaglandins that are released by the uterus and it gets better with age. It can be treated by simple treatments to lower prostaglandins such as magnesium, ibuprofen and a whole food diet that has anti-inflammatory properties. There exists another type of period’s pain. Not the usual pain that is relieved with ibuprofen, but that is much worse. This type of pain is referred to as “secondary dysmenorrhea”, a term used for pelvic pain during period caused due to an underlying disease. In case you are having such symptoms, visit your physician and explain them your condition. You can describe your pain by telling them the number of painkillers you have to take per day. In case your physician dismisses your concern, you should get a second opinion from another doctor. Find a physician who will examine you physically and order some blood tests and pelvic ultrasound. These investigations may help your physician find any underlying disease including infections, adenomyosis, endometriosis or uterine fibroids. Apply heat such as by a heating pad to lower abdomen. Never sleep with heating pad as it may cause burns. TENS (transcutaneous electrical nerve stimulation). Read product reviews and compare brands before purchasing TENS unit. You can also drink chamomile tea as the ingredients present in it help in relieving pelvic pain by relaxing uterus. Herbal medicines used by Chinese have also been found to decrease menstrual cramps. Certain vitamin supplements and herbs such as lavender, pycnogenol and fennel may also help. You can take ginger powder during the initial three to four days of your menstrual cycle. Be cautious while taking herbal supplements as they are not regulated by the FDA for purity and quality. You should take plenty of sleep and rest and also do regular exercise. Majority of females can find relief with OTC medicines. Anti-prostaglandins help by reducing uterine cramping, relieving discomfort and lightening blood flow. Painkillers including naproxen or ibuprofen (type of NSAIDs) may also be present in these medicines. NSAIDs may be taken alone to decrease pelvic pain during period. Hormonal BCPs (birth control pills) may be prescribed by your doctor to prevent the occurrence of ovulation and decrease the severity of period pain. They cause thinning of the uterine lining; thereby, reducing bleeding and cramping. Apart from pills, other methods of birth control such as vaginal rings, hormonal IUD, injections and patches may be used to reduce cramping. In case pelvic pain is caused by an underlying disease such as fibroids or endometriosis, surgery is required to remove the abnormality. Eat vegetables and fruits and limit your intake of alcohol, fat, sweets, salt, and caffeine. Yoga or acupressure and acupuncture may help; however, more research is required.